Local fiction author and freelance journalist, Anju Gattani is the author of the recently released novel,’ Duty and Desire’. NRI Pulse caught up with Anju during her author talk and signing event at the Louie E. & Gertrude C. Jones, Alpharetta Branch Library in Alpharetta, Georgia on Tuesday, Feb 14. Duty and Desire, A novel of modern India follows the life and times of a well educated, well groomed, beautiful Sheetal Prasad. Sheetal surrenders love for honor and marries into India’s titanic royal family, only to discover a haunting reality that has been masked for years under the guise of royalty. Born in India, Gattani spent her formative years in Hong Kong. 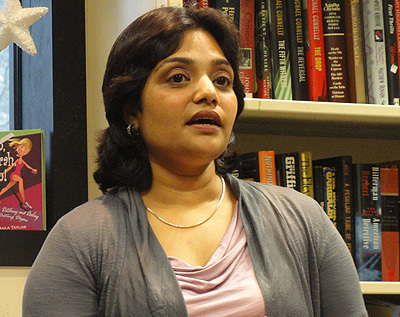 Having lived in India, Singapore, Australia, New Jersey and Connecticut, Georgia is now her home with her husband and two boys. All the travel, she says opened and warmed her to issues that affect people around the world. “One of the goals is to bridge cultures and break barriers” she said. Gattani’s said she started to write in 2002 and had the first draft in about a year and half. The book, she said has come a long way since the first draft, with plenty of rewrites based on her own research and inputs and guidance from other authors. She talked about her mentors, NYTimes Bestselling author Haywood Smith and USA Today Bestselling author, Jade Lee, who helped critique her manuscript and guide her writing. She clarified that the while the authors had taught her what it means to be a professional author and helped bring her writing to American publishing standards, they did not write, or in any way, create Duty and Desire. Gattani also enlisted help to learn and understand the lifestyle of the rich and famous – what they wear, eat, how they live to give a realistic touch to her characters and their way of life. The Mittal wedding scale is something she was going for, in scale and grandeur of the Dhanraj family occasions.